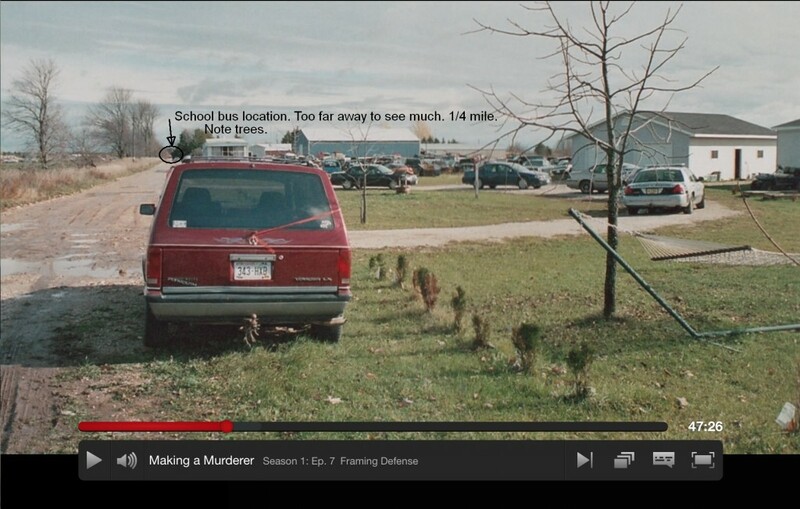 Could the bus driver really see Teresa Halbach taking photos? I’m addicted. Yes, the ‘Making a Murderer’ Netflix series has me by the throat. I don’t know if I’ll blog much about it, but I was just looking at some photos and I think the bus driver testimony is ‘off’. I lived on a 40 acre farm. I have a feel for the distance from one corner to the other on a side. It’s a very long way. But given the obstructions, low sun in the afternoon, I’m not sure the bus driver could see Teresa taking those photos unless she drove the bus up this Long Road and did a turn around in the Barb Janda drive (where the four cars are). What do you think? Bus distance, approx 1/4 mile. JanW on Could this die have caused the marks on Hae Min Lee’s body? L on Could this die have caused the marks on Hae Min Lee’s body? Robin on Could this die have caused the marks on Hae Min Lee’s body? TS on Could this die have caused the marks on Hae Min Lee’s body?